Does SciVation Xtend Work to Build Muscle? Among the most serious bodybuilders and other top flight athletes there comes a day when they all realize that there are certain aspects of their training which must be followed to the highest degree in order compete with the very best in their chosen pursuit. To do this they must find numerous ways to maximize the gains made from each and every workout session; the benefits of each and every recovery period and the nutrition from each and every dietary choice. Another critical but often overlooked factor is related to the use of supplements. Yes, the most serious bodybuilders and athletes eventually come to know that in today's world no one can compete at the highest levels without the benefits of top flight supplements which allow everything else that they to have the fullest possible effects. And when it comes to providing oneself with the greatest amount of energy in order to take workouts to their maximum potential nothing is more important than an energy boosting supplement which can provide the greatest possible amount of BCAA's or branched-chain amino acid. The biggest problem that has come about because of the fantastic advances that BCAA's have brought to energy supplements is that fact that their own success and popularity has invited a deluge of new products into the market, most of which have been shown in multiple studies to be less effective than the very best of what the market has had to offer over the previous few years. This issue has led to a large amount of both confusion among consumers and a great deal of frustration with those who have actually bought many of them based on the fact that many of these lesser products often claim to be made using most of the same basic ingredients as the industry's best and making nearly all of the same types of claims as the industry leaders, as well. With this being the case we, as a part of our ongoing efforts to help our many valued readers find the products that will most likely work best for them, have decided to take a long hard look at one of the most talked about bodybuilding and athletic energy booster - it's called SciVation Xtend. Like all products of this nature there are many claims being made by the manufacturer which are hard to assess based on all of the available data both from the producer and several outside sources. In the sections ahead we will attempt to discern between what is fact and what is fiction given that much of what can be determined is open to a great deal of speculation. Aside from the non-active list of ingredients the key active ingredients are a series of BCAA's or branched-chain amino acid which is an amino acid with an aliphatic side-chain with a branch - a central carbon atom attached to three or more carbon atoms. In this class of proteinogenic amino acids, there are three BCAA's including leucine, isoleucine, and valine. One key aspect of looking at any product and attempting to determine just how safe and effective it might be is related to the list of ingredients and a subject which goes well beyond that - it's the way in which those ingredients are formulated. One way to look at this is to think about a hypothetical product which might have all of the very best ingredients but in amounts which are below the standard doses. The ultimate result would likely be a product which would not end up being very effective. To prevent problems of this nature most reputable producers engage in a high degree of research, studies and clinical trials to prove the product's safety and efficacy. Based on a search of multiple sources from both the manufacturer and several outside and unaffiliated resources we could not find any evidence of any such research, studies or testing which could be proven to be credible or verifiable. One of the most daunting facts that most sellers have to deal with is that most consumers are highly suspicious of most sales tactics. One tactic that most consumers have been shown to trust to a high degree are testimonials and user reviews. The problem that comes about with these types of comments is that they tend to be most often seen by consumers on websites and other forms of marketing materials which were originally created and often remain under the control of the seller. This leads to what can only be described as an obvious and inherent bias in the comments as a company would not likely use comments that were in any way negative. For this reason we always look for more independent sources of testimonials and user reviews. 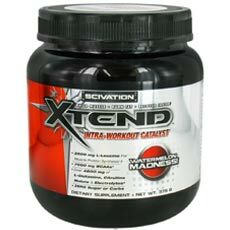 Going over numerous industry related websites with no known affiliation to SciVation Xtend or its manufacturer plus multiple online forums and chat rooms known to discuss bodybuilding supplements we found a large cache of independent user reviews for this product. After compiling the overall ratings of these it has become quite clear that the large majority of them were rather negative in their assessment of their experience even after long term use of a month or more. Given the track record associated with products of this general composition there is no credible reason to believe that there are any significant health concerns for otherwise healthy individuals. Still, it is always advisable to seek out a consultation with a primary care physician or other qualified medical professional before beginning a daily regimen of this or any other product of this general composition. This product is available for purchase through numerous online retail outlets at an average cost of $26.80 per container. As we discussed at the top of this review any serious bodybuilder or top athlete of any kind has to know that everything that they do from workout routines to recovery periods to nutrition can be greatly enhanced by supplements which boost the benefits gained by all of them. When it comes to energy boosting supplements those containing BCAA's have become the industry standard. The question we wanted to answer in this review is whether SciVation Xtend is one of the best options that the market has offer. To come to a conclusion we decided to look at three core aspects. One is to look at the set of ingredients and based on what is known from all sources it appears clear that this product does measure up fairly well versus most of the top performing supplements available today. Another is related to the formulation of those ingredients and, as we pointed out earlier, there is little to no evidence of any data that would support the fantastic claims being made for SciVation Xtend. The final aspect has to do with what the majority of independent user reviews have had to say about their experiences and here there is no doubt that most of them that we have seen do not believe that this product lives up to its claims. All in all there seems to be little doubt that SciVation Xtend as currently constituted is not one of the best available options for the most serious bodybuilders and other top athletes. For more information on high quality, top rated energy boosting supplements for bodybuilders and other athletes available on the market today, click here.